Progressives are split over how to tackle global warming without sparking a populist revolt against a carbon tax and higher gas prices. WASHINGTON — With backing from progressive Rep.-elect Alexandria Ocasio-Cortez, activists have taken Congress by storm in recent weeks with rallies demanding radical action to prevent a climate catastrophe. On Monday, over 100 protesters were arrested at the offices of House Democratic leaders. But 3,800 miles away in Paris, there's a very different set of climate-related protests going on as French activists, angered by a fuel tax, have plunged President Emmanuel Macron's administration into crisis. The French "yellow vest" protests have ignited a debate on the left in the U.S. over how to avoid a similar backlash if Democrats get the chance to enact new environmental laws. And the demonstrations come as environmental issues are taking on more prominence amid dire reports from the United Nations and U.S. government warning lawmakers they have only limited time to minimize the damage. At the center of the debate is whether Democrats should pursue a carbon tax as part of their climate plan or whether they might risk enraging low- and middle-income voters, particularly those in rural and suburban America, by raising the cost of living. Watching the news in France unfold, Center for American Progress President Neera Tanden chastised some on the left for expressing sympathy with the protesters "amassing against a carbon tax." That drew a sharp response from the Democratic Socialists of America, who accused Tanden of defending "regressive taxes that don't make the rich and fossil fuel companies pay their fair share." Because regressive taxes that don't make the rich and fossil fuel companies pay their fair share are, you know, bad? Because working class people don't want to foot the bill for crappy neoliberal policies, and we know when we're being screwed? Activists and academics in America wonder whether what's happening in France might foreshadow struggles at home someday, especially after Donald Trump rode populist resentment of his own to victory in 2016. Trump, who has dismissed his own government's climate reports, has already claimed the Paris demonstrations as validation of his decision to abandon the Paris Climate Agreement. What's more, the U.S. is currently defending the use of fossil fuels at the ongoing United Nations climate talks in Poland. While not the same as the French fuel tax, the carbon tax has long been touted by many climate experts as a simple way to push companies and consumers toward a green economy by making pollution more expensive. But the newest wave of American climate activists, including Ocasio-Cortez, have taken a different approach. Although not explicitly opposed to a carbon tax, they've focused their energy on what they call a "Green New Deal" that would put federal spending on renewable energy on par with wartime military budgets. "Any sort of Macron-style carbon tax that's coupled with extreme austerity measures handing more wealth to those on top is not progressive," Waleed Shahid, a spokesman for Justice Democrats, told NBC News. "This mistaken and elite-driven approach to climate is exactly what the Green New Deal aims to combat through massive public investment and economic mobilization." The details of the Green New Deal are still vague. Ocasio-Cortez is calling for a House Select Committee to study the issue and come up with a plan to move quickly to a renewable energy economy rather than begin with one specific approach. That gives lawmakers some flexibility, and activists see it as a more sustainable political message as well. Rather than lead with a punitive tax, they are instead pitching their plan as a way to create jobs at home. "The Green New Deal would not only tackle climate change, but poverty and unemployment in a way we've never seen in our lifetimes," Stephen O’Hanlon, interim communications director for the Sunrise Movement said, while participating in the climate change sit-in at House minority leader Nancy Pelosi's office on Monday. On the other hand, carbon tax supporters say it's not fair to lump their ideas in with Macron's fuel tax, nor to treat them as mutually exclusive to a Green New Deal. Proposed carbon taxes on the left, like a plan by economists Mark Paul and Anders Fremstad at the People's Policy Project, and on the right, like a plan backed by former George W. Bush adviser Greg Mankiw and former Ronald Reagan adviser Martin Feldstein, take into account the impact on working people. Both plans propose using revenue from the tax to pay dividends to Americans that would at least partially offset increases in the cost of living. "If leftists can't get behind a carbon tax (properly designed, of course), we're in real trouble," Michael S. Linden, a fellow at the Roosevelt Institute, tweeted on Monday. But there could be limits to a carbon tax as well. While France's situation is unique, Kristina Costa, a fellow at the Center for American Progress, said it pointed to the challenge of tackling pollution from cars and trucks, which she noted is an urgent need but harder to achieve than other emission cuts, including at power plants. Because large swaths of America are dependent on cars, a carbon tax could raise the cost of commuting, but not always change their behavior. "It will increase prices and people will feel that, but if you live in rural Indiana, you don't have a choice but to drive a car," she said. To soften the blow, policymakers could keep raising fuel standards on vehicles and pumping research dollars and tax credits into electric vehicles so that owners are less affected by changes in oil prices. But that runs into dangerous territory: Consumers might see higher prices from a carbon tax before they see the benefits from new technologies. 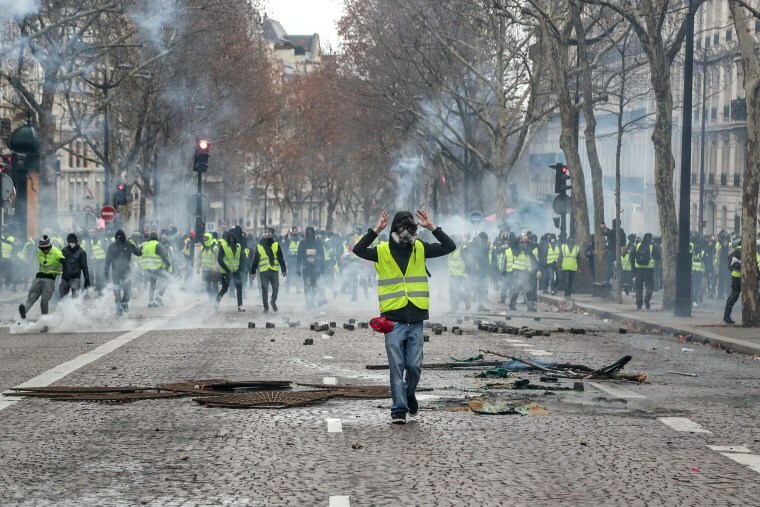 Lex Paulson, a political science professor at Sciences Po Paris and strategist for Macron's En Marche movement, said the protest's roots were complex and fed into a broader revolt beyond the fuel tax alone, but he still saw important lessons for the climate debate in America. Getting buy-in from voters on an overall plan is important, and Macron set the stage for a populist backlash in part by imposing the fuel tax while cutting taxes for the wealthy at the same time. "Unless everyday people feel like the change being asked of them is fair and fits into a coherent vision, they will reject it as something by an elite for an elite," Paulson said.